We don’t call ourselves the POOR PEOPLE’S United Fund for nothing. The needs of the people we serve are far greater than our ability to help. The load has doubled during the last year and there is no end in sight. In fact, we haven’t seen the worst of it yet. As more and more people are being dismissed from public support, our phones never stop ringing. The dramatic increase in the need for basic human services is peaking, and without you, we have no place else to turn. Please help us help those dismissed from human services. The need has never been greater. Tell your friends about us, get on our mailing list (mailinglist@ppuf.org) and JOIN US TODAY! We have several easy and fun Poor People’s United Fund donation, fundraisinig and advocacy programs. E-mail us at donations@ppuf.org, or give us a call at 617-262-5922 for details on these and other programs that support the Poor People’s United Fund mission. Online donations can be made by credit card via a service provided by First Giving. and click the logo to make a donation via Paypal. If you work for one of the more than 50 companies that offer Community Works as a charitable donation option, you can contribute to Poor People’s United Fund by choosing the Community Works option. For a list of companies see http://www.communityworks.com/giving-at-work/partner-businesses/. If your company does not offer Community Works as an option, contact us to find out how you can help us add Community Works to your company’s payroll deduction program. We have several options for community groups, churches, schools and other local organizations wishing to support the Poor People’s United Fund mission of educating, advocating and fundraising for poor and homeless people. Contact us at donations@ppuf.org. Support PPUF by hosting an event. Having a birthday party, bar/bat mitzvah, block party or other celebration? Host a Poor People’s Party and ask your friends and neighbors to contribute to Poor People’s United Fund. Contact us at donations@ppuf.org. 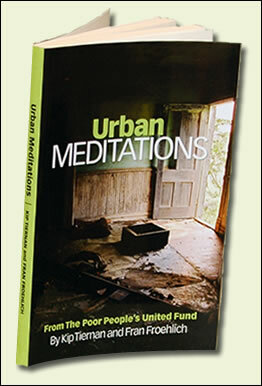 Urban Meditations is outcast political theology by two of Boston's leading advocators, Kip Tiernan and Fran Froehlich. It is a forty-year reflection on life for some in Boston and elsewhere. Money from the sale of the book – $20.00 (includes postage and handling) – will continue to help them run this economic ministry. Please consider a donation to PPUF to help us carry on with our work.